Thomas Müntzer (German pronunciation: [ˌtoːmas ˈmʏnt͡sɐ̯]; c. December 1489 – 27 May 1525) was a radical German preacher and theologian of the early Reformation whose opposition to both Luther and the Roman Catholic Church led to his open defiance of late-feudal authority in central Germany. Müntzer was foremost amongst those reformers who took issue with Luther’s compromises with feudal authority. 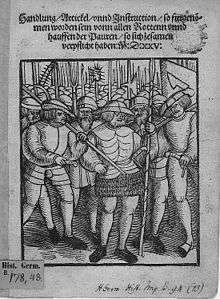 He became a leader of the German peasant and plebeian uprising of 1525, was captured after the battle of Frankenhausen, and was tortured and executed. Few other figures of the German Reformation have raised so much controversy —which continues to this day— as Müntzer. A complex and unique figure in history, he is now regarded as a significant player in the early years of the German Reformation and also in the history of European revolutionaries. Almost all modern studies of Müntzer stress the necessity of understanding his revolutionary actions as a consequence of his theology: Müntzer believed that the end of the world was imminent and that it was the task of the true believers to aid God in ushering in a new era of history Within the history of the Reformation, his contribution – especially in liturgy and Biblical exegesis – was of substance, but remains undervalued. Thomas Müntzer was born in late 1489 (or possibly early 1490), in the small town of Stolberg in the Harz Mountains of Germany. The legend that his father had been executed by the feudal authorities has long since been shown untrue. There is every reason to suppose that Müntzer had a relatively comfortable background and upbringing – as evidenced by his lengthy education. Both his parents were still alive in 1520, his mother dying at around that time. Soon after 1490 the family moved to the neighbouring and slightly larger town of Quedlinburg, and it was as ‘Thomas Munczer de Quedlinburgk’ that he enrolled at the university of Leipzig in 1506. Here he may have studied the Arts or even Theology: relevant records are missing, and it is uncertain whether Müntzer actually graduated from Leipzig. He later enrolled in late 1512 at the Viadriana university of Frankfurt an der Oder. It is not known what degrees he had obtained by 1514, when he found employment within the Church: almost certainly a bachelor's degree in theology and/or the arts; and possibly – but less certainly – a master of the arts. Again, the university records are full of holes, or are completely missing. At some time in this rather obscure period of his life, possibly before his studies at Frankfurt, he held down posts as an assistant teacher in schools in Halle and Aschersleben, at which time, according to his final confession, he is alleged to have formed a ‘league’ against the incumbent Archbishop of Magdeburg – to what end the league was formed is wholly unknown. In May 1514, he took up a post as priest in the town of Braunschweig (Brunswick), where he was occupied on and off for the next few years. It was here that he began to question the practices of the Catholic Church, and to criticise – for example – the selling of indulgences. In letters of this time, he is already being addressed by friends as a ‘castigator of unrighteousness’. Between 1515 and 1516, he also managed to find a job as schoolmaster at a nunnery in Frose, near Aschersleben. At St Mary’s, Müntzer carried on as he had started in Jüterbog. This brought him into conflict with the representatives of the established Church. He still regarded himself as a follower of Luther, however, and as such he retained the support of the town council. So much so that when Egranus returned to post in late September 1520, the town council appointed Müntzer to a permanent post at St Katharine’s Church. St Katharine’s was the church of the weavers. Even before the arrival of Lutheran doctrines, there was already in Zwickau a reform movement inspired by the Hussite Reformation of the 15th century, especially in its radical, apocalyptic Taborite flavour. Amongst the Zwickau weavers this movement was particularly strong, along with spiritualism. Nikolaus Storch was active here, a self-taught radical who placed every confidence in spiritual revelation through dreams. Soon he and Müntzer were acting in concert. In the following months, Müntzer found himself more and more at odds with Egranus, the local representative of the Wittenberg movement, and increasingly embroiled in riots against the local Catholic priests. The town council became nervous at what was going on at St Katharine’s, and in April 1521 at last decided that enough was enough: Müntzer was dismissed from his post and was forced to leave Zwickau. Müntzer initially travelled over the border into Bohemia to the town of Zatec (Saaz) - this town was known as one of the five ‘safe citadels’ of the radical Taborites of Bohemia. But Müntzer only used this as a stop-over en route to Prague. It was in Prague that the Hussite Church was already firmly established and Müntzer thought to find a safe home where he could develop his increasingly un-Lutheran ideas. He arrived here in late June 1521, made welcome as a ‘Martinist’, a follower of Luther, and was allowed to preach and to give lectures. He also found the time to prepare a summary of his own beliefs, which appeared in a document known to posterity – slightly misleadingly - as the Prague Manifesto. This document exists in four forms – one in Czech, one in Latin, two in German; one of them is written on a large piece of paper, about 50 cm by 50 cm, much like a poster, but written on both sides. But it is evident that none of the four items was ever published in any shape or form. The contents of this document indicate clearly just how far he had diverged from the road of the Wittenberg reformers, and how much he believed that the reform movement was something apocalyptic in nature. "I, Thomas Müntzer, beseech the church not to worship a mute God, but a living and speaking one; none of the gods is more contemptible to the nations than this living one to Christians who have no part of him." His next post was both relatively permanent and productive. 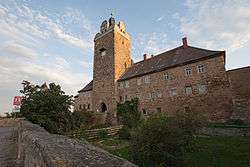 In early April 1523, through the patronage of Selmenitz, he was appointed as preacher at St John’s Church in Allstedt in Saxony. He found himself working alongside another reformer, Simon Haferitz who preached at the church of St Wigberti. The town of Allstedt was small, barely more than a large village (population: 600), with an imposing castle set on the hill above it. Elector Friedrich held the right to appoint to St John’s, but the town-council either forgot to advise him, or did not feel that his approval was necessary. Almost immediately on arrival, Müntzer was preaching his version of the reformed doctrines, and delivering the standard church services and masses in German. Such was the popularity of his preaching and the novelty of hearing services in German that people from the surrounding countryside and towns were soon flocking to Allstedt - some reports suggest that upwards of two thousand people were on the move every Sunday,. Within weeks, Luther got to hear of this and wrote to the Allstedt authorities, asking them to persuade Müntzer to come to Wittenberg for closer inspection. Müntzer refused to go. He was far too busy carrying through his Reformation and wanted no discussion ‘behind closed doors’. At this time, he also married Ottilie von Gersen, a former nun; in the Spring of 1524, Ottilie gave birth to a son. It was not only Luther who was concerned. The Catholic Count Ernst von Mansfeld spent the summer of 1523 trying to prevent his own subjects from attending the reformed services in Allstedt. Müntzer felt secure enough to pen a letter to the Count in September, ordering him to leave off his tyranny: "I am as much a Servant of God as you, so tread gently, for the whole world has to be exercised in patience. Don’t grab, or the old coat may tear. (...) I will deal with you a thousand times more drastically than Luther with the Pope." Throughout the remainder of 1523, and into 1524, Müntzer consolidated his reformed services and spread his message in the small town. He arranged for the printing of his German Church Service; the Protestation or Proposition by Thomas Müntzer from Stolberg in the Harz Mountains, now pastor of Allstedt, about his teachings; and On the Counterfeit Faith, in which he set out his belief that the true faith came from inner spiritual suffering and despair. In the Spring of 1524, supporters of Müntzer burned down a small chapel at Mallerbach, much to the annoyance of the abbess of the Naundorf nunnery. The town-council and the castellan failed to do anything about her complaint. But in July, Müntzer was invited before the Electoral Duke Johann in Allstedt Castle, possibly in lieu of a belated ‘trial sermon’, and there he preached his famous sermon on the Second Chapter of the Book of Daniel (aka The Sermon Before the Princes) – a barely concealed warning to the princes that they should pitch in with the Allstedt reforms or face the wrath of God. "What a pretty spectacle we have before us now – all the eels and snakes coupling together immorally in one great heap. The priests and all the evil clerics are the snakes...and the secular lords and rulers are the eels... My revered rulers of Saxony...seek without delay the righteousness of God and take up the cause of the gospel boldly"
He travelled first to Nuremberg in the south, where he arranged for the publication of his anti-Lutheran pamphlet A Highly Provoked Vindication and Refutation of the unspiritual soft-living flesh in Wittenberg, as well as one entitled A Manifest Exposé of False Faith – both of which were confiscated by the city authorities, the former before any copies could be distributed. Müntzer kept a low profile in Nuremberg, clearly considering that his best strategy would be to spread his teaching in print, rather than end up behind bars. He remained here until November and then left for the south-west of Germany and Switzerland, where peasants and plebeians were beginning to organise themselves for the great peasant uprising of 1525 in defiance of their feudal overlords. There is no direct evidence of what Müntzer did in this part of the world, but almost certainly he would have come in contact with leading members of the various rebel conspiracies; it is proposed that he met the later Anabaptist leader, Balthasar Hubmaier in Waldshut, and it is known that he was in Basel in December, where he met the Zwinglian reformer Oecolampadius, and may also have met the Swiss Anabaptist Conrad Grebel there. He spent several weeks in the Klettgau area, and there is some evidence to suggest that he helped the peasants to formulate their grievances. While the famous ‘Twelve Articles’ of the Swabian peasants were certainly not composed by Müntzer, at least one important supporting document, the Constitutional Draft, may well have originated with him. In February 1525 Müntzer returned to Mühlhausen (via Fulda, where he was briefly arrested and then – unrecognised – released) and took over the pulpit at St Mary’s Church; the town-council neither gave, nor was asked for, permission to make this appointment – it would seem that a popular vote thrust Müntzer into the pulpit. Immediately, he and Pfeiffer - who had managed to return to the town some three months earlier - were at the centre of considerable activity. In early March, the citizens were called upon to elect an ‘Eternal Council’ which was to replace the existing town-council, but whose duties went far beyond the merely municipal. Surprisingly, neither Pfeiffer nor Müntzer were admitted to the new council, nor to its meetings. Possibly because of this, Müntzer then founded the ‘Eternal League of God’, in late March (but some researchers date this League to September 1524). This was an armed militia, designed not just as a defence-league, but also as a God-fearing cadre for the coming apocalypse. It met under a huge white banner which had been painted with a rainbow and decorated with the words The Word of God will endure forever. In the surrounding countryside and neighbouring small towns, the events in Mühlhausen found a ready echo, for the peasantry and the urban poor had had news of the great uprising in south-west Germany, and many were ready to join in. Luther pitched in very firmly on the side of the princes; he made a tour of southern Saxony – Stolberg, Nordhausen, and the Mansfeld district – in an attempt to dissuade the rebels from action, although in some of these places he was roundly heckled. He followed this up with his pamphlet Against the Robbing and Murdering Hordes of Peasants, calling for the ruthless suppression of the revolt. This had a title and a timing that could not have been more ill-judged – it was the German peasantry who at that time died in their thousands: estimates put the figure at 70-75,000, possibly even as high as 100,000 - at the hands of the princely armies. Müntzer’s theology has been the subject of many studies over the years. Modern researchers agree that Müntzer was deeply read and that it was his theology, and not any socio-political dogma, which drove him to stand up to feudal authority. The short paragraphs below attempt to give a very brief summary of his theology. Despite the profusion of Biblical quotations in Müntzer’s writings, it was his doctrine that true belief was dictated by spiritual experience, not by written testimony. The Bible was for him evidence only of spiritual experiences of the past: the words of the Bible still had to be validated by the working of the Spirit in the believer’s heart. ‘If someone had never had sight or sound of the Bible at any time in his life, he could still hold the one true Christian faith because of the true teaching of the spirit, just like all those who composed the holy Scripture without any books at all.’ The insistence on written, Biblical proof by the ‘academics’ or scholars (this included Luther) meant that it was impossible for the common man to gain a true understanding of the true faith. Müntzer’s true believers (also known as ‘the Elect’) were capable of reaching faith through personal suffering – guided by ‘true servants of God’, and without regard to Catholic or Lutheran-reformed priests. Spiritual revelation came sometimes through dreams and visions and sometimes through suffering. In Zwickau, Müntzer’s belief in the possibilities of revelation by dream matched the same belief in the sect of radicals led by Nikolaus Storch – Storch was later to confound Luther’s colleague Melanchthon with plausible arguments about this. Müntzer himself clearly believed in the power of vision and dream – as evidenced by his lengthy and carefully argued Sermon Before the Princes, which discussed the dream of Nebuchadnezzar: "So to expect visions and to receive them while in tribulation and suffering, is in the true spirit of the apostles, the patriarchs, and the prophets. Hence it is no wonder that Brother Fatted Pig and Brother Soft Life (i.e. Luther) reject them. But when one has not yet heard the clear word of God in the soul, one has to have visions." It was essential, in Müntzer’s view, for a person to experience real suffering and pain – either spiritual or physical – in order to come to a true Christian belief. The theme of hardship and suffering, purgation and sevenfold cleansing, runs through all of his writings. "What you must do is endure patiently, and learn how God himself will root out your weeds, thistles and thorns from the rich soil which is your heart. Otherwise nothing good will grow there, only the raging devil... Even if you have already devoured all the books of the Bible, you must still suffer the sharp edge of the plough-share". On the very eve of battle at Frankenhausen, he had this to say to the people of Allstedt: "May the pure fear of God be with you, dear brothers. You must remain unperturbed. If you fail to do so, then your sacrifice is in vain, your heart-sad, heart-felt suffering. You would then have to start suffering all over again... If you are unwilling to suffer for the sake of God, then you will to be martyrs for the devil"
One of the principal dialectics in Müntzer’s teaching is the opposition of the ‘Fear of Man’ to the ‘Fear of God’. Regardless of one’s position in society, it was necessary for the true believer to have a Fear of God and to have no Fear of Man. This was the thrust of his Sermon Before the Princes and it was the rallying call in his final letter to Mühlhausen in May 1525: "May the pure, upright fear of God be with you my dear brothers." In his Sermon Before the Princes he stated quite clearly: "The fear of God must be pure, unsullied by any fear of men or creaturely things. How desperately we need a fear like this! For just as it is impossible to fear two masters and be saved, so it is impossible to fear both God and created things and be saved." Interwoven with Müntzer’s mystical piety, as for many of his contemporaries, was a conviction that the whole cosmos stood at a tipping point. Now God would set right all the wrongs of the world, largely by destruction, but with the active assistance of true Christians. From this would emerge a new age of mankind. In the Prague Manifesto he wrote: "O ho, how ripe the rotten apples are! O ho, how rotten the elect have become! The time of the harvest has come! That is why he himself has hired me for his harvest." In a stirring letter to the people of Erfurt, in May 1525, he wrote: "Help us in any way you can, with men and with cannon, so that we can carry out the commands of God himself in Ezekiel 14, where he says: ‘I will rescue you from those who lord it over you in a tyrannous way... Come, you birds of heaven and devour the flesh of the princes; and you wild beasts drink up the blood of all the bigwigs’. Daniel says the same thing in chapter 7: that power should be given to the common man’." In his final confession under torture of May 1525, Müntzer stated that one of the primary aims of himself and his comrades was ‘omnia sunt communia’ – "all things are to be held in common and distribution should be to each according to his need". This statement has often been cited as evidence of Müntzer’s ‘early communism’; but it stands quite alone in all of his writings and letters. Thus, it is far more likely to have been a statement of what his captors feared than what Müntzer actually believed. Indeed, even at a very late stage, Müntzer still accepted some form of social hierarchy, based on functions bound up with the work of God, rather than inheritance. In this roiling pot of ideas, we find that Müntzer quite readily respected Luther for a period and then just as readily rejected the Lutheran doctrines. Although it is clear in retrospect that Müntzer’s ideas were already diverging from Luther’s at least as early as the period in Zwickau, Müntzer himself may not have been aware of this. In July 1520, he was still able to sign off a letter to Luther as "Thomas Müntzer, whom you brought to birth by the gospel". However, it is clear that Luther considered that Müntzer was moving ahead too fast, and correspondence (now missing) from Wittenberg seems to have contained explicit criticisms of his activities. By March 1522, Müntzer was writing to Melanchthon in Wittenberg, warning that "our most beloved Martin acts ignorantly because he does not want to offend the little ones... Dear brothers, leave your dallying, the time has come! Do not delay, summer is at the door. ... Do not flatter your princes, otherwise you will live to see your undoing." An attempt at reconciliation with Luther, in a letter written by Müntzer from Allstedt in July 1523, went without reply. In June 1524, however, Luther published his pamphlet A Letter to the Princes of Saxony concerning the Rebellious Spirit, which essentially called on Prince Friedrich and Duke Johann to deal firmly with the 'rebellious spirit of Allstedt', this 'bloodthirsty Satan'. Shortly afterwards, Müntzer described Luther as ‘Brother Fatted Pig and Brother Soft Life’ in his Sermon Before the Princes. 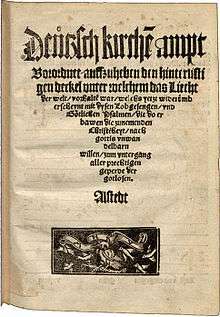 After the summer of 1524, the tone of the written conflict became ever more bitter on both sides, culminating in Müntzer’s pamphlet A Highly-Provoked Vindication and a Refutation of the Unspiritual Soft-living Flesh in Wittenberg of 1524, and in Luther’s A Terrible History and Judgement of God on Thomas Müntzer of 1525, in which the radical preacher (by then dead) was described as ‘"a murderous and bloodthirsty prophet". During the last two years of his life, Müntzer had come into contact with a number of other radicals – prominent amongst them were Hans Hut, Hans Denck, Melchior Rinck, Hans Römer and Balthasar Hubmaier: all of them were leaders of the emerging Anabaptist movement, which nurtured similar reformed doctrines to those of Müntzer himself. While it is not appropriate to claim that they were all or consistently ‘Müntzerites’, it is possible to argue that they all shared some commom teaching. A common thread links Müntzer, the early Anabaptists, the ‘Kingdom of Münster’ in North Germany in 1535, the Dutch Anabaptists, the radicals of the English Revolution, and beyond. There was a short-lived legacy even within the ‘official’ reformed church as well: in the towns where Müntzer had been active, his reformed liturgies were still being used some ten years after his death. Since around 1918, the number of fictional works on Müntzer has grown significantly – this encompasses novels, poems, plays and films – 200 and more, almost all in German. A film of his life was produced in East Germany in 1956, directed by Martin Heilberg and starring Wolfgang Stumpf. In 1989, shortly before the fall of the Berlin Wall, the Peasants' War Panorama at Bad Frankenhausen was opened, containing the largest oil painting in the world, with Müntzer in central position. The painter was Werner Tübke. ↑ No contemporary portrait of the reformer exists. This engraving may have been a copy of a picture made by Hans Holbein the Younger in Basel - but all evidence suggests that Holbein had left for France before Müntzer came to Basel in late 1524. Another possibility is that the original portrait was made by Sebald Beham, one of the 'three godless painters' of Nuremberg, when Müntzer was in that city in late 1524. Michael G. Baylor, ed. (1993). Revelation and Revolution: Basic Writings of Thomas Müntzer. Bethlehem, PA. ISBN 0-93422-316-5. Peter Matheson, ed. (1988). The Collected Works of Thomas Müntzer. Edinburgh. ISBN 0-56729-252-5. Günther Franz & Paul Kirn, ed. (1968). Thomas Müntzer – Schriften und Briefe. Kritische Gesamtausgabe. Gütersloh. Ludwig Fischer, ed. (1976). Die lutherischen Pamphlete gegen Thomas Müntzer. Tübingen. ISBN 3-42304-270-2. Günter Vogler (2012). "Thomas Müntzer – Irrweg oder Alternative? Plädoyer für eine andere Sicht". Archiv für Reformationsgeschichte. Gütersloh. 103.